As I told mearliernd ealier this week... reallyly really want to like Tommy Amaker. He says all the right things -- He is certainly a stand-up guy... he seems to recruit very well. Again, I really want to like him. The problem is, he just doesn't appear to be a good coach at all. "Just not an X's and O's guy" some may say... Losing 7 of your last 9 games due to sloppy play and turn-overs is a sign for bad coaching if I've ever seen one. He has excuses (injuries, sanctions when he first got here, facilities, etc) BUT ... Good coaches don't use execuses. They get wins with the talent they have around them. Not I'm not saying that I think Tommy should get the boot just yet ... But I would like to see a little sense of urgency for once! I feel like he is fully OK with not making the Tournament in 5 years. 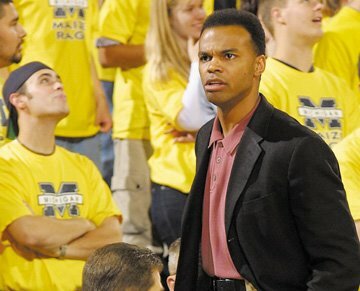 I would like to be patient with you Mr. Amaker - but if I have to follow UM hoops for 2 more years without making the big dance (which would make 12 in a row), I just may lose it. Hire some assistant coaches with some in-game coaches skills. You can still be the face guy that everyone likes. PLEASE! In a related note, did you see San Diego State go up by 15 in the second half, squander the lead, go down by a few points, miracuously go up by two with about 15 seconds left, have the point guard foul a guy shooting a three, go to overtime, and lose? Steve Fisher "coaching" at its finest.